If you're not a huge fan out the outside world but are doomed to traverse it frequently, then I'm pretty sure GM talked to you about designing the new 2015 Chevy Suburban and its Yukon/Tahoe twins. These are well-built cars that I have zero interest in owning, but that's not really GM's fault. They're just following orders. And, by orders I mean actual orders for these trucks, of which there are many, many, many, and orders as in the requests of all the focus groups and customer surveys they conduct. These haulers of moms, kids, and secret servicemen have been tailor-made to the requests of their customers, and those customers, on paper, sound a little bit like Howard Hughes in his later years: removed, paranoid, and locked in a climate-controlled luxury prison of their own desire. That comes off a little harsh. These aren't bad vehicles at all, and they have some pretty significant improvements over the previous generations (though still basically the same platform as before), but these aren't vehicles for people who love cars or trucks, not really. These are cars designed to coddle and isolate the drivers and passengers from the outside world. For example, the engine, a massive 5.6L or 6.2L V8, has been designed to be as quiet as possible, and just to be safe, all the glass is specially-laminated to keep exterior noises down even further. And then there's a noise-cancellation system in the Denali trim. These fuckers are quiet. When it comes to the Tahoe/Suburban/Yukon siblings, GM's hands are pretty well tied by what their target market will accept. They can make improvements and minor design changes, but nothing too radical. That's why getting into the third row seats is still kind of a pain, even with the very complex seat-folding away dance the second row does. A van-style sliding door or wider than normal rear doors or even an extra set of doors sure would make this more practical, but that'd be going too far. I mean, if we're totally honest, a luxurious AWD van would do the job much better. But, for complicated cultural and status reasons, this sort of customer demands a big-tired (up to 22s, now) vehicle with a long hood and a massive front grille the size of many cars' windshields. The 2015 redesign does clean things up nicely. On the Chevy versions, you get a nice little fender-dagger that intrudes into the light units, and the lines have generally been ironed and crisped a good bit. The rear wiper is cleverly hidden under a spoiler, and the overall look is handsome, if a little bland and bulky still. The GMC Yukon version gets a colossal cheese-grater grille and unique lighting that uses LEDs to make a signature set of square brackets, front and rear, but is otherwise pretty much the same as its brothers. The interiors are well-done on all versions, with soft-touch materials all over and real stitching on just about everything you can touch. The days of fake, molded-in stitching are so far gone I'm almost nostalgic for it now. Almost. There's at least 8 USB plugs around the car, and one 110V outlet, conveniently located near the rear DVD screen composite inputs, so you can easily plug in your Intellivision. The Denali trim level on the Yukon I tested has a much nicer instrument cluster with a big, reconfigurable LCD screen, and all have a center-stack LCD with an interface that still looks like a Chinese iPhone iOS knockoff from two years ago. I'm not sure why their UI people still seem stuck in the fake-shiny era of 2009. Cargo area in the shorter versions of these is actually pretty restricted with the third row up, but still usable. third row down gives a good amount of room, huge in the XL versions. It's still not that much more (if at all) than you'd have in a full-sized station wagon, and it's less than most vans and some minivans. Oh, and there's also GM's new fave secret cargo area behind the center screen, which is perfectly-sized for a microwave. More importantly, the Suburban/Tahoe/Yukons are one of the few remaining vehicles you can get with all bench seating. We didn't have one to test, and I'm told that option is much more popular in the Middle East market, but it's available. That bench seat also explains why the column shifter is there. It doesn't explain why it's still just a 6-speed auto when competitors are moving to more advanced units, like the new Cherokee's 9-speed. That nostalgic idea of the bench seat sort of drove home my issues with these trucks. I have a bit of a history with Suburbans, since as a kid I was a Boy Scout. We went camping around once a month, and one of our scoutmasters had one of those 70s-80s era Suburbans: big, plaid bench seats, minimal interior trim, and painted something bright, like a banana yellow, I want to say? That car made some sense. It wasn't a particularly good or refined car, but it sat a crapload of people and their stuff in reasonable comfort, and was rugged enough to get pretty much wherever you needed to go. It wasn't a rock climber, but it'd get you to a campsite. It had roll-down windows and I don't recall any air-conditioning, but I liked it an awful lot. Modern Suburbans are not used like this. These interiors do not lend themselves to lots of camping gear and packs of idiotic pubescents in khaki, and even if they did, the ride height is so minimal at the front, I don't think you'd get to a remotely rugged campsite without taking out several grand worth of underbody plastic and foglight. That's not to say these are incapable of driving through rough conditions — when I drove from Tahoe in the Suburban, it was in a pretty intense snowstorm, and the roads were not in good shape at all. 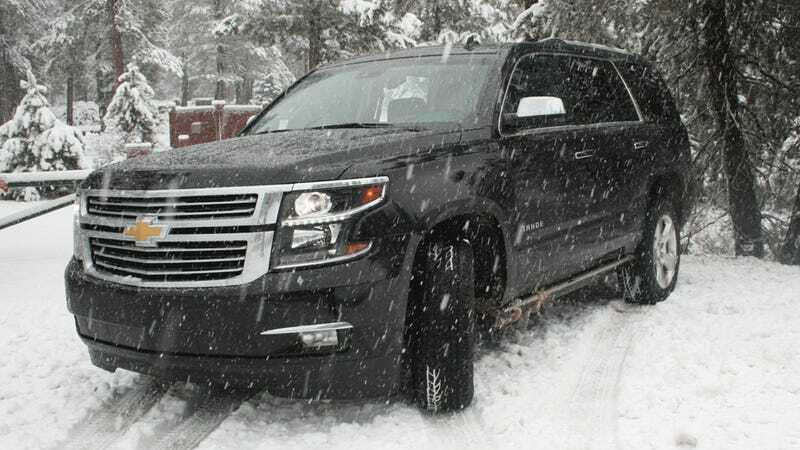 We were instructed to keep the trucks in auto 4WD mode, and the Suburban handled the slick, snow-choked roads well. There was some sliding during lane-changes through piled bunkers of snow, but that's to be expected and more the fault of the tires rather than the 4WD system, I think. The car felt in control the whole time, even when it got so bad we had to follow a highway patrol car and plow limiting drivers to 30 mph. Once out on dry roads around Napa, I was able to get a better sense of how these drive. The electrically-assisted power steering helps save gas, the engineers told us, but it's pretty numb feeling. It's sensitive enough and responds well, but you don't get much road feel there. Plus, these trucks are bulky and heavy — ranging from about 5300 - 5900 lbs, and you're always aware of their mass and length. The new direct injection engines are interesting — the EcoTec 5.3L makes 355 HP/383 lb-ft, and the 6.2L puts out 420 HP/460 lb-ft. That's a good bit of power, but I found the acceleration unimpressive. GM's engineers told me the 6.2 will got to 60 in 5.8 seconds, which is impressive for a vehicle that size, but it doesn't feel all that quick to drive. But, of course, that's not really what these are for. The huge engines aren't quite as thirsty as you'd guess — 16 MPG in the city, 22 (2wd) or 23 (4wd) highway — and take away one each for the 6.2L. That's not terrible, and a lot of how it manages that is via cylinder de-activation, where that big V8 becomes a big V4 every chance it gets. That also makes the Tahoe/Suburban/Yukon very likely the only V4 (sorta) engine option available in the US today. So, if driving a V4 is your main goal and you have more people to haul than will fit in a Saab Sonnet, I think you've found your next car. The Suburban name's been around 80 years, and it's interesting to see where these have come. GM even brought out a lovely old 2nd-gen Suburban, and I'm pretty sure if you showed the now-likely-dead driver of that vintage car the power footsteps and automatically folding/unfolding rear seats and multiple video screens and ghost-number HUD display, they'd crap themselves in a nice, terrified, old-timey way. One of the other big things GM did for this line is to address the fact that people really like to steal these. To that end, they beefed up the security a lot, making the doors slim-jim proof, adding in interior motion sensors and vertical-motion jacking sensors to detect if wheels are getting removed. If anything suspicious happens, the truck screams like a crazed banshee for help. Those piercing alarms probably will drive away many would-be Grand Theft Autofolks, along with the soothing sleep of anyone within a few blocks, but it also brings up a huge omission. All these trucks have OnStar — why doesn't the system call in to OnStar, when it's compromised? It doesn't, because I asked, and never got a good reason why. You'd think the whole point would be to let you or the cops know when the car was being broken into, but this looks to be a missed opportunity for GM. Seems like an easy software fix, though. I think GM did a very good job building these trucks to the exact specifications of what their customers want, and those customers will likely be happy. Those customers better be pretty liquid, too, since prices start around $45,000 and go up to over $80,000 for a GMC Yukon Denali with all the toys. I still don't really get the appeal of these things — they feel too constrained by arbitrary restrictions that keep them from becoming all they can be, and they're for people who want a very different driving experience than me. Still, those people will probably love them, so I don't think GM's going to lose any sleep over what I say.